Meteorological measurements in Bosnia and Herzegovina began in the Austria-Hungary time, at 80th of 19 century. The military, for its own needs, had set meteorological station in Sarajevo, Mostar and Tuzla 1879 years. After that, 1892. and next year, the Bosnian-Herzegovinian Provincial Government organized a fairly dense network of meteorological stations, equipped to the then standards, and formed the Central Office in Sarajevo. Sarajevo and Mostar became the station and 1st level, Travnik, Tuzla and Bihac second level, and apart from these there were 68 stations and the third level. Since 1892 years we started with the regular annual publishing the results of observations and measurements from a network of meteorological stations. 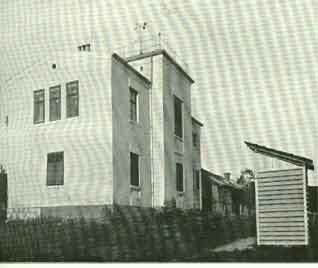 Meteorological Observatory at Bjelasnica built in 1894, and at 1 august began work as a altitude stations of 1st level, and worked continuously until 1941 when it was destroyed in the war. The former Mayor of Sarajevo, Mustajbeg Fadilpašić, had a significant role in the formation of weather station in the city, in Bjelave. The construction of this station began in 1900 and was completed in 1902 year. However, the greatest contribution to the establishment of meteorological services in Bosnia and Herzegovina gave Philip Balif that is, except attempting to maintain continuity in the work of observation and did much service to the exploitation of data for practical purposes. As a result of his work created a map of average rainfall in Bosnia and Herzegovina. After the death of Balifa 1905 years there has been stagnation in the development of meteorological services. Number of stations in this period grew steadily, but the quality of the observations was not satisfactory. As director of Observatory in Sarajevo, during this period, was appointed Harisch Otto, who is working in the Department of road construction of Construction Administration. Meteorological Service has no major functioned until 1914, when the war started due to the closure of many stations. One can therefore say that in 1913 completed a whole year in observatory service. The release of the data collected is complete with a series of continuous observation for 20 years. After the war, in 1918, the Weather Service has reorganized and for this purpose is former Meteorological Office was transformed into an independent institute, at the Department of Education of Provincial Government. Till 1921 in the Institute were quite unstable, practically did not define what is whose the jurisdiction, which is made with the shortage of staff that this institution is working in difficult circumstances. In October of 1920 was made reorganization, and as a scientific adviser appointed Jovan Popovic, and in March of 1921 Milan Markovic was appointed director of the Institute. In 1922, a conference in Belgrade adopted the conclusions on which the weather service should be decentralized in different climatic regions, whereby a central administrative office in Belgrade. Accordingly the Department has jurisdiction over the territory of Bosnia and Herzegovina and the territory of Dalmatia, while the Split does not establish a Bureau of Maritime Meteorology. During the WW2 almost complete network of meteorological and hydrological station was destroyed. In 1947, the Government of the then Federal Republic of Yugoslavia, adopted a decision on the unification of hydrology and meteorology in a unique and Hydrometeorological Service. In this way, the hydrometeorological service management is that the Federal Hydrometeorological Institute and the Weather Bureau in the republics of former Yugoslavia, including the Republic Hydrometeorological Institute of SR BiH. After the aggression on Bosnia and Herzegovina in 1992, a large number of stations ceased to operate, only Sarajevo and Sanski Most in the continuity of observations and measurements carried out during the war. The station at Bjelasnica worked until May 1993 when it was destroyed by the aggressor, and was again restored the funds of the Institute in September 1999. The Institute got the status of the Meteorological Institute of Bosnia and Herzegovina Government's decision in June 1992. Bosnia and Herzegovina became a full member of the World Meteorological Organization (WMO) June 30, 1994, 1997 years act Federal Government established the Federal Meteorological Institute, which is 2007, is also an act of the Government of the Federation was renamed the Federal Hydrometeorological Institute.